Just like in people, bad breath in pets is often a sign of dental disease and requires dental cleaning and further treatment to safeguard your pet’s health. Roswinn Pet Hospital offers a professional deep dental cleaning and our pet dental services include: oral/dental exam, deep dental cleaning and polishing, teeth extraction and oral mass removal if indicated. Root canals, dental x-rays, braces, crowns, caps, implants, and periodontal surgery for pets? You must be kidding! Not at all. Dental procedures are performed daily in veterinary practices. How does a loving pet owner know if dental care is needed, and where can a pet owner go for advanced dental care? Examination is the key to diagnosis and helps determine the type of treatment needed. The veterinarian needs to know what to look for. A pet owner can help by examining their pet's teeth and mouth at least monthly. First smell your pet’s breath. If you sense a disagreeable odor, your pet may have gum disease. 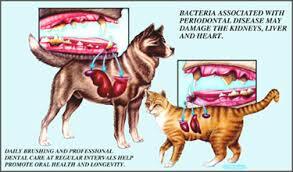 Periodontal disease is the most common ailment of small animals and is treatable. Gum problems begin when bacteria accumulates at the gumline around the tooth. Unless brushed away daily, these bacteria can destroy tooth-supporting bone, cause bleeding, and tooth loss. Usually the first sign is bad breath. If your pet is experiencing frequent pain or refusing to eat, has changed chewing habits, or has moderate to severe mouth odor, then an oral problem is probably the cause. When examining your pet's mouth, look for tooth chips or fractures on the tooth's surface. Contrary to their popularity, chewing on cow hooves, antlers, rocks, bones, or other hard materials may break teeth. If the fracture is deep you may notice a red, brown, or black spot in the middle of the tooth's surface. The spot is the tooth’s nerve and inside vessels, which when exposed to the oral cavity may eventually lead to a tooth painful abscess. When your home exam reveals dental problems or if you are still uncertain, a trip to the veterinarian is in order. The veterinary oral examination will begin with a complete visual examination of the face, mouth and each tooth. Frequently pet's mouths have several different problems that need care. The veterinarian will usually use a record chart similar to the one used by human dentists to identify and document such dental problems. A more detailed exam then follows. Unfortunately cats and dogs cannot point to dental abnormalities with their paws, and to determine the proper treatment plan, other tests are usually necessary. General anesthesia is essential for a proper tooth-by-tooth evaluation. There is a wide array of safe and effective anesthetics and monitoring equipment that make anesthesia as safe as possible. Expect your veterinarian or dental assistant to use a periodontal probe to measure gum pocket depths around each tooth. One or two millimeters of probe depth normally exists around each tooth. When dogs or cats are affected by periodontal disease, the gums bleed and probing depths may increase, which require additional care to save the teeth. Unfortunately by the time some pets come in for dental care, it is too late to save all of the teeth. Your veterinarian may also take x-rays of the entire mouth. X-rays show the inside of the tooth and the root that lies below the gum line. Many decisions are based on x-ray findings. Usually the veterinarian will visually examine the mouth, note any problems, take x-rays under anesthesia, and then tell you what needs to happen to treat the problems found if any. If your dog or cat needs advanced dental care, where can you go? Many veterinarians have taken post-graduate dental training in order to better serve their patients. Some veterinarians have passed advanced written and practical examinations given by the American Veterinary Medical Association, which certifies them as dental specialists. If you need one, your veterinarian can refer you. Dogs and cats do not have to suffer the pain and discomfort of untreated broken or loose teeth or infected gums. With the help of thorough examinations, x-rays, dental care, and daily plaque prevention, your pet can keep his teeth in his mouth where they should be. Call Roswinn Pet Hospital to set up your pet’s dental appointment.